Before he plunged into politics, Edcel Lagman was an excellent litigator. His old law firm was the Romero Lagman Chato Torres and Pasamba which held fort at the old Rada Building in Legaspi Village. Mike Romero of Lakas ng Demokratikong Pilipino and former representative of Negros was a partner. Willy Chato, the better half of Liwayway Chato; Ruben Torres of Zambales and former Labor Secretary; and Ely Pasamba of Quezon Sangguniang Panlalawigan, were his partners. PANAMIN or the much discredited Presidential Arm for National Minorities counted as one of Lagman’s roster of clients. Manuel Elizalde paid Lagman a handsome retainer until he fled the country in 1983 in the heels of an international report that the famed TASADAYS were a hoax. One of his able associates was Hector Soliman, the husband of the now DSWD Secretary, Dinky Juliano. Since his graduation from the UP College of Law in 1966, Lagman went on to excel in law practice. Right after the EDSA revolt, Edcel was recruited as DBM Undersecretary and later Secretary of the agency. In 1992, he was elected congressman of the first district of Albay. He was virtually an unknown in his home province prior to 1986, but he bluffed his way to Congress with SAROs in his pocket that virtually bathed Albay with its first durable infrastructures that endeared him to his mga tugang. In other words, he was an original Cory Aquino appointee. We saw the Cory years as watershed for first-rate appointments: Conrado Vasquez as Ombudsman and his Deputy, Jose Colayco, Hilario Davide and Isagani Cruz in the High Court, FVR as defense chief, Jovito Salonga in the PCGG, Wigberto Tanada in Customs, Rene Saguisag as Chief Legal Counsel, Joker Arroyo as Executive Secretary, and a host of others. From his election in Congress in 1992, Lagman exhausted the maximum 3-term limit. As congressman, he invented the euphemism Countrywide Development Fund (later re-labelled as Priority Development Assistance Fund) or simply the pork barrel. He made sure that the CDF is an item in the budget, an entitlement of a congressman whether he is in the majority or minority or regardless of his party affiliations. The pork barrel as it was understood before martial law was a discretionary enticement for political reason. A political hold out is deprived of the fund. With Edcel at the helm of the appropriations committee of the House of Representatives, he made sure that the CDF is etched in stone. No less than the Supreme Court agreed with Edcel that congressmen in this country can dabble as secretary of the public works, aside from being an absentee legislator. Edcel was the toast of the town in his first term with the congressmen assured of a piece of the action. The SOP was born. Lagman became a good friend of a colleague from Quezon, Danny Suarez, who like him was elected in 1992 and just like him is in his sixth term. They were bosom buddies for the rest of their three successive terms such that Suarez campaigned for Lagman in Quezon when the latter ran for senator, albeit unsuccessfully, in 1998. Barnstorming the entire province of Quezon, he was a guest of Suarez in his Halina Hotel in Lucena City. Lagman’s daughter Cielo Kristel pinched-hit for him in 1998 when he ran and lost in his first Senate try alongside with Nani Perez and Joe de Venecia for President. Carpet bagging in 2001 he ran for Congress not in Albay but in Quezon City pitted against Mel Mathay and Nanette Castelo-Daza, where he and Mel were clobbered by the latter. Leaving behind a political machinery in Quezon City, he allowed his son, Edcel Greco, to bench warm for him as City Council member waiting for an opportune time to wrest the congressional seat from Castelo-Daza. Between 1998 to 2004, he went back to law practice. In 2004, his daughter gave way to her old man and Edcel reclaimed his old seat in Albay. He went on to get re-elected three more times until the last elections in May, 2010. As congressman during GMA’s term as president he was in the ramparts foiling a succession of impeachment complaints against her. Finding himself in the company of a 29 marginal ragtag team, he was selected as Minority Floor Leader. His group made a token opposition against Sonny Belmonte in the latter’s run for the Speakership. It looks like Suarez wanted to contest the Speakership alongside with Edcel. Per Inquirer account: Suarez recalled that at the end of the House session in December, he approached Lagman to ask if the latter had any last minute instructions for him and if there were any bills he wanted pushed. He said he was surprised and “offended” when Lagman told him that the other members of the minority should first be consulted on the matter of the group’s leadership. “I’m very sad that it had to go this far,” Suarez told the Inquirer. “I would not ask for it if there was no agreement. Medyo napahiya ako (I was embarrassed). The fact is there was an agreement but he refuses to honor it. You know me, I would not do that to him if there was no such agreement. Hindi naman ako ganyan (I’m not that kind of person).” Suarez said 19 minority members met last month to discuss the matter and that “after the meeting, all 19 approached both of us and said we should honor the term-sharing agreement.” But Edcel said, ‘Hindi naman tayo kumpleto eh’ (But not all of us are here),” Suarez said. Lagman is saying now that where he got elected Speaker half of the term goes to Suarez. The latter however claims that that was not the original accord. 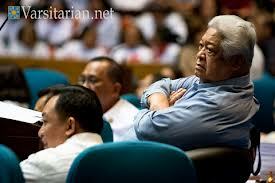 Suarez knows that Lagman’s bid as speaker was futile as neither of them has the number. In the end, they opted to cut the minority position plum: Edcel gets the first half, while Danny enjoys the last. But Edcel the lawyer and voluble at that was a better minority mouth piece. He was able to stall the impeachment of the former Ombudsman Mercy Gutierrez snatching a 6-month reprieve from the Supreme Court. When the President bulldozed his Truth Commission by executive fiat and appointing former Chief Justice Davide as its Chair and appropriating P80M from the President’s fund, Edcel, brushing up on his public law finagled a Supreme Court decision excising the executive order creating the Truth Commission as unconstitutional. He was at the forefront when her lawyers brought her down the drain with their antics: one of them offered not his testimony but his testicles while pontificating behind the portrait of Adolf Hitler. Edcel made good use of his legal expertise approximating that of Titong Mendoza. But he was not being acknowledged. GMA ignored his representations. She relied on her minions that doubled as exhibits of the quality of her choice: asked why Arroyo would want him ousted, Lagman said that “she is unable to appreciate quality and commitment.” This statement is fodder to the Impeachment Prosecutors of Chief Justice Renato Corona. Or this is an indirect description of the caliber of the Supreme Court super majority that foils P-Noy in every which way. With this back and forth, GMA again got her comeuppance: Edcel identified her stooge. He didn’t say though that Suarez, Romualdez and Villarosa are her Useful Idiots. By the way, Hector Soliman was my former officemate at the Development Academy of the Philippines. We were mere underlings in the same different headed by the Dr. William Torres, the first Filipino with the computer science doctorate, and project directors Dr. Mahar Mangahas and Dr. Philip Medalla. Of course, DAP head honcho was Dr. Onofre Corpuz, concurrently UP president and assisted by Boy Morales, Ping de Jesus and Jolly Benitez, among others. DAP KJ lived up to its name as the mill of first rate leaders. Tony Kalaw, its President today, is a dear friend. At least in Quezon, two of our congressmen are always in the news, Cong. Erin Tanada and Cong, Danny Suarez. With the turn of events, we will not be surprised if Lagman will join the administration just like the hordes of congressmen who were previously singing hossanas to GMA. most likely KJ. we have a term for that, nagkaka-asiwaan na!